The resort feature a natural oriented Dolphin Experience every day. 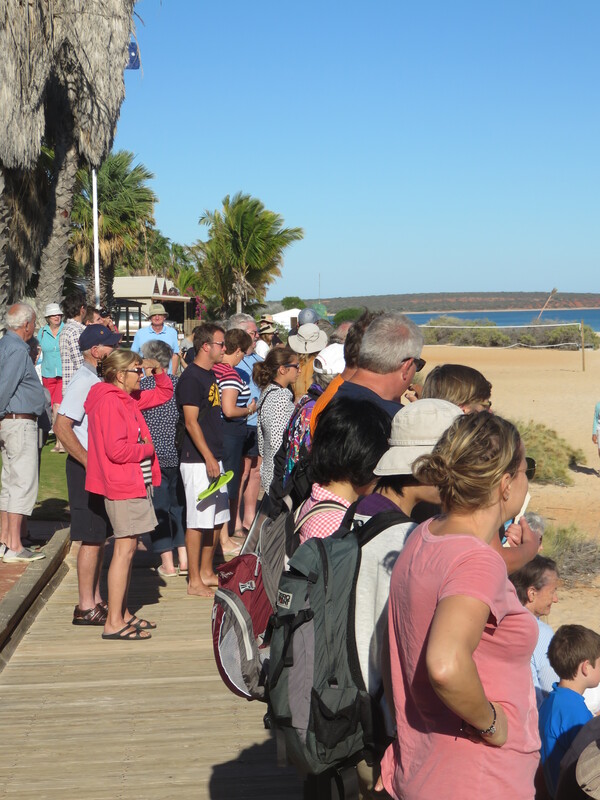 (For more information about the great work that’s done here, visit http://www.sharkbay.org/Monkey_Mia_dolphin_history.aspx). This is a organized feed of five dolphins that each day get up to a total of 1,5 kg of fish over three feedings. Considering the adult dolphin needs from 15-20 kg of fish a day, it’s not making them solely dependent on this food source for survival. This also ensures that they take their calves out to deeper water and teaches them to fish also. It is only these named five Dolphins that will get food. Leaning over gives them ability to see “upwards”. They know who’s who by looking at their dorsal fin. The nips and cuts in the fins are what makes each dolphin unique in looks and make it “easy” to separate them. 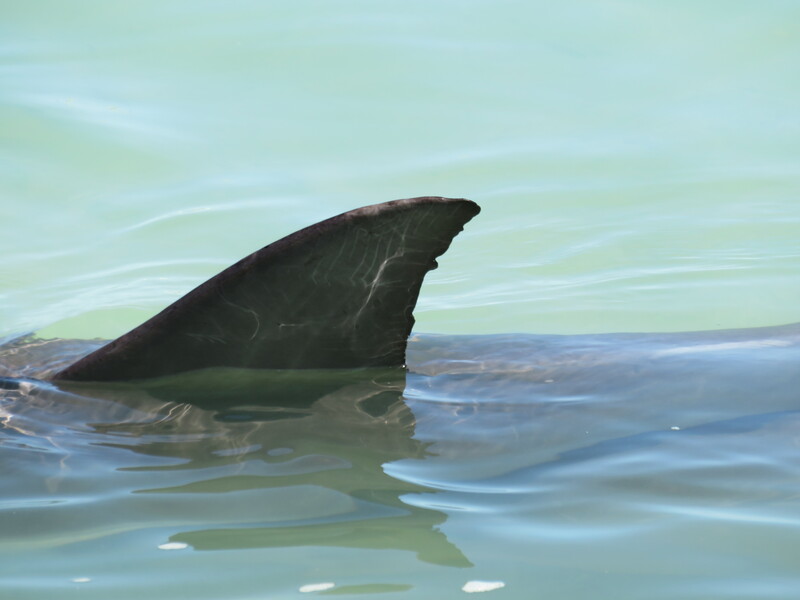 Non of the about 3000 dolphins in the Monkey Mia and Shark bay area are marked with transmitters, they are all separated by their unique dorsal fin. They also only feed five female dolphins. The male tends to be overly aggressive and uncontrollable. It is common for the male to pair up in groups that may last a lifetime. This groups kidnap and herds a single female and takes turn with her until she’s pregnant. This makes for a relative small group of possible fathers for the offspring. It is also known that male dolphins have killed calves of others to make the female ready for mating again. Still think they’re cute? We were at the beachwalk 7:30 along with a lot of others. We got really nice information about the program, the different dolphins that would be fed and how it was to be done. It is all up to the dolphins. If the five come they get fed, there is no trickery to get them to shore. No waving, throwing of fish or otherwise spectacular. So for the first feeding three of the five came in. We got to go into the water, but no one get to touch the dolphins. Not even the park rangers do that. They told us it was the hardest part of the job. Not to touch when they come up close and swim by your leg. But bacteria from us can be devastating to them, so keep your hands in your pocket. The feeding is done by the public in an orderly manner. As written they only get up to 500 gram per feeding, up to three times a day. So there are workers coming with buckets of fish and they select who is to come out to them and give the Dolphins a fish. A lot of people want to do this, but they enforce strict rules about behavior. Pointing, waving, saying it’s your birthday, staying g in the water at feeding time etc. will not get you selected. Katja got picked at the first of the three feeds and luckily did I get picked on the second. It’s over if you blink for the dolphin will take the fish from you and swallow it whole. Wham, bam, thank you mam. We attended all three of the feedings and learned something every time. There were three different rangers that led the feed, and that gave different views and perspective on the story of the Dolphins at Monkey Mia. Oh, and you wonder about the name of Monkey Mia? So do most people. We got told that Mia is an old Aboriginal word for “gathering”. Whether or not there has been Monkeys here, no one knows. There are none here now. Dolphins spend one third of their day sleeping, one third socializing and one third hunting/eating. When they sleep they lay in the surface with their blowhole above water and sleeps with one eye open and with half their brain active. They are conscious breathers, and must therefor think about breathing for every breath. And the other reason for this sleep behavior is that they can be alert for any danger approaching. You can sometimes find them doing this in a line in the water. Then it will be some who are completely awake and take the role as guards as the other sleeps. It is usually seconds or a few minutes to every sleep, so I guess the follow DaVinci’s five minute an hour theory. When they are pregnant they carry for 12 months. The last six is when the belly swells up and they get ready for giving birth. This is also the time they separate from the previous offspring that now needs to fend for itself. Usually this is 4 years after birth. So the calves stay with their mother for a long time after birth, getting breastfed for many years. Dolphins are actually a evolved land animal who went to sea, not the other way around. Hence the blowhole and breastfeeding. Oh, and the killer whale is also a dolphin. And they eat the spotted or bottle nose Dolphins if they can catch them. The only marine animal know. To go after it’s cousin. Still think Dolphins are cute? After the feed we boarded Shotover, a catamaran that would take us animal watching. We spent three hours at sea and watched Dolphins, sea turtles, Dugong (sea cow) and eagle ray. It was nice three hours with the sun shining from a cloudless sky and with lots happening. As always there is one person or one family in every such event that makes everyone else shake their heads and look away. Let’s say no more about them. Back to shore, change of clothes and stuff in the backpack and back on the boat. This time for the sunset cruise. 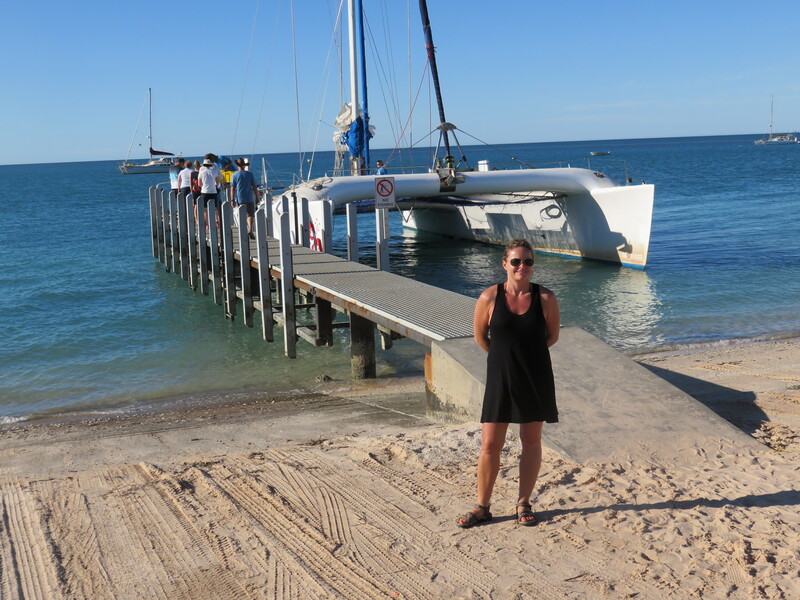 One and a half hours with sailing in Shark Bay. Monkey Mia is located in Shark Bay, known for its many sharks. Remember the uniqueness of the dorsal fin on the Dolphins? It’s not uncommon that the nicks and cuts are from shark bites. From the sea towards the Monkey Mia. Flat! We did the restaurant dining experience the last night. We did a three course meal and it was great. With barbecued kangaroo for me and pork chops for Katja as mains we had a great meal. Turid & Terje this was a really nice meal 🙂 Then it was back to the room to pack and get read for the next 8 hours of driving further north to Nigaloo Reef and Coral Bay tomorrow.